Ever since we started this corner, we have talked about the substance of journalism, the words, the photos and its principles. Yet, it is also high time we paid attention to the technical details and materials it requires. It is something quite relevant to the Turkish media recently and may very well eventually be relevant worldwide due to the environmental costs and consequences of paper production. The page numbers of newspapers are becoming fewer every day in Turkey. Once enough to be considered a small novella in terms of pages, space is now more precious than ever. The reason behind this is quite simple. Paper became twice as costly in the last year in Turkey. Despite what the knee-jerk assumption might be, the first and only reason behind the price hike of paper was not the recent fluctuations in currencies. The dramatic changes in supply and demand had already led to a price hike; currency fluctuation only served to exacerbate this hike and its negative consequences. Before going on any further, however, let's look at the reasons behind the shifts in the supply and demand of paper around the globe. There are several major paper suppliers and consumers around the world. Market and price were familiar with their patterns of production and consumption. China was one of those major players. The current situation started with several factories in China.These factories were closed due torenovation efforts. This, of course, led to a drop in supply that also caused China to draw paper from other markets in significant quantities. The major paper manufacturers adapted to this change by changing the quotas assigned to regions and countries. Another change was raising the price of paper. All this started long ago before the currency fluctuations and its negative results. Prices were already raised in foreign currency. So, consider this for a moment. While the industry was already reeling and trying to account for the increase in prices in foreign currency, the local currency started to lose value in a dramatic fashion against those foreign currencies. The resulting situation was extremely problematic, to say the least. There could be more reasons listed as an underlying cause of the fluctuations in paper prices. But when you look at the overall picture of the current situation at hand, all of these shares a single overarching trait as far as Turkey is concerned: External dependence. 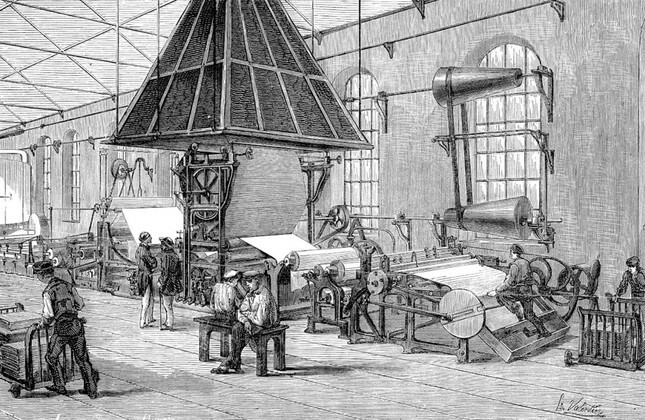 Paper, one of the key raw materials that civilization is built upon, is a matter of national importance. It is the same as bread, water, and air as far as a society is concerned. It should also be considered a matter of national security. Just as Turkey is capable of actually building its own unmanned aerial vehicles (UAVs) today, it should be able to produce its own paper, sufficient for its domestic demand if needed. Although to be fair, Turkey actually produces a fair amount of paper but manufacturers, quite justifiably, I might add, spend their capabilities on producing wrapping paper and so forth. They are after all, more profitable than newsprint, which shunts it firmly to the backseat. Of course, some might say that we were already producing our own newsprint paper, back in the day. And that cost more than simply importing it from abroad. To that, I would actually agree but with a caveat. It costs more than importing it because when we were manufacturing our own paper, we would also import a necessary raw material needed for manufacturing paper. That raw material was cellulose. Nowadays, if you are not also producing the raw material of a product yourselves, if you are not using local technologies, if you are unable to build huge companies and brands, your production efforts do not amount to much, unfortunately. With that said, what should be done? What is the solution to this dilemma? The answer is obvious: We should start, as soon as possible, to produce our own cellulose. With that road map providing us with an answer to the question of "what," it is time to look at "how." When you look at the possible avenues of cellulose production, there are several options immediately available to you. One of those is the eucalyptus. Unfortunately, it is quite difficult to raise that plant in Turkey in meaningful amounts due to environmental conditions. There is another option, however: Cannabis. Cannabis is a plant that can be raised quite easily in Turkish climate. It is also one that grows quite rapidly. Its production works with almost a zero waste management principle. Let's look at the pros: It is suited for our climate, it grows fast and is perfect for industrial agriculture purposes. It is perfect for our cellulose needs. Now, I can almost hear my colleagues in other newspapers start thinking about catchy titles about cannabis and the Daily Sabah ombudsman. But that does not mean I am completely serious on this matter. If we are to solve the paper issue of Turkey in the middle and long term, one of the best options available to us is to ramp up cannabis production. Cannabis has become quite a hot topic in recent years. Several states legalizing it a couple of years back followed by Canada legalizing it quite recently may lead to similar actions around the globe. But I don't believe we should muddy the waters with legalization discussions. This is simply a matter of obtaining cellulose locally in a feasible manner. Cannabis is a plant that can easily be distinguished as to whether it is male or female. Not all cannabis is for drug production. It can already be used not just for paper production but also for medicinal purposes. I also do not suggest a free for all when it comes to planting cannabis. Instead, we should build industry forests, while setting some rules for its planting and harvesting processes to maintain sustainability. It should be closely regulated by the state. If there were worries about it getting out of hand down the line, production can be a monopoly of the state as well. There are ways to make all of it feasible quite easily if we are determined to shore up our lack of raw materials in paper production. As they say, if there is a will there is a way. The way is clear, we only need the will to see it realized. Consider this for a moment: You can be a newspaper consisting of the best reporters, the most qualified editors and wonderful columnists. Yet at the end of the day, you lack the paper you need to see all of that talent and hard work to reach your readers. Or consider another situation: The cost of paper is already more than five times the price of the newspaper itself. How long can this newspaper continue to exist? These are the situations we are experiencing and will continue to experience in increasing manner if something is not done about the paper situation. Newspapers are not alone in this conundrum either. The same goes for books as well. The publishing industry is experiencing the same problems. Despite the digitalization of media, external dependence when it comes to paper is one of the most serious problems our country faces and steps must be taken immediately to solve or at least alleviate it.